Our Western Adventure – Rivers and Creeks and Waterfalls, Oh My! 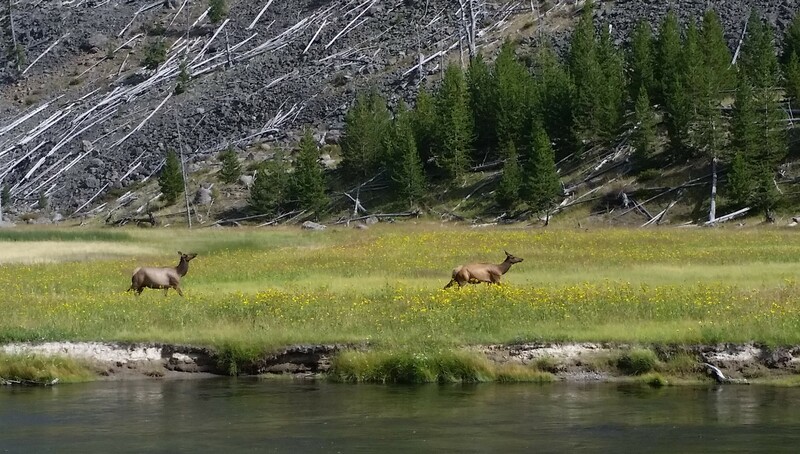 We watched these two elk for quite a while as they frolicked in the field, and eventually crossed the river further downstream. 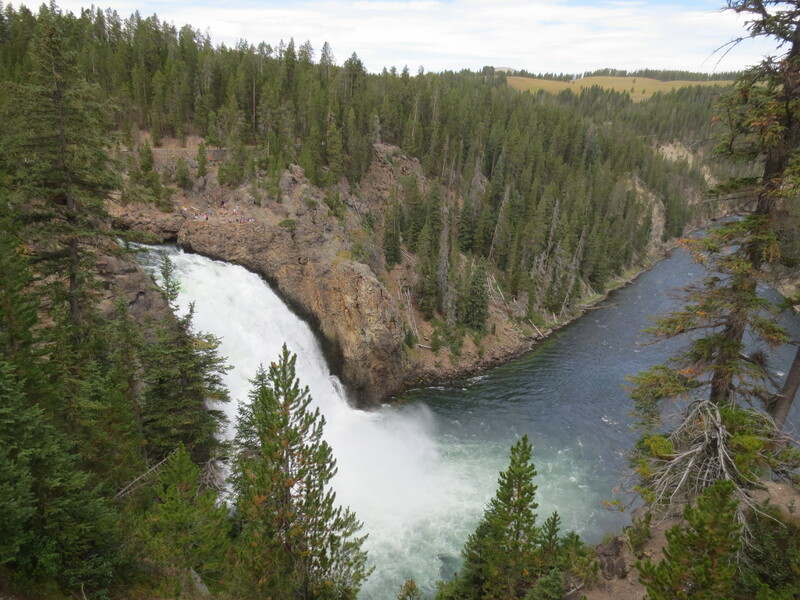 All throughout Yellowstone National Park, there are rivers, creeks, lakes, and amazing waterfalls in addition to the other water features I have already written about. Besides how beautiful the scenery was, the animals were attracted to the areas as well. On Wednesday of our trip, we saw 2 elk playing in the water. We sat and watched them for quite a long time. The sounds the female elk make are much higher than what you’d expect from such a huge animal. We guessed one might have been the mother of the other, as the one we suspected was the younger kept making yipping noises. We cracked up every time we heard that sound! Another time we stopped at an overlook at one of the rivers, a badger decided he wasn’t so sure he wanted to let us get back to our car. We had to very slowly walk past his den, one at a time, never taking our eyes off him. Many animals in Yellowstone will run after you if you run. We didn’t want to test the badger to see if he would be one of them. Our wrangler on our Cowboy Dinner later in the week told us there are 3 B’s to watch out for in Yellowstone: Bears, Badgers, and Buffalo. They are all dangerous. Happily, we were smart around all 3, and no one was hurt. 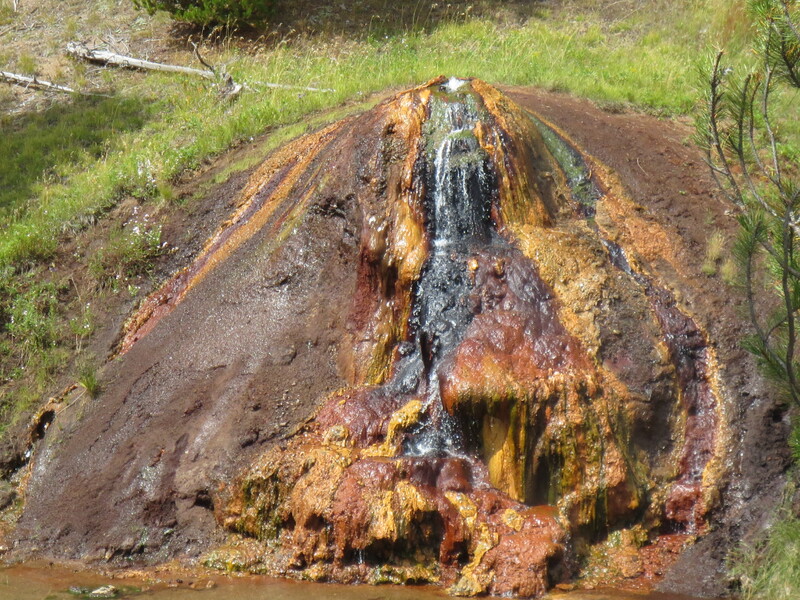 A few times during the week, we passed by a creek that had a geyser on one side. On Wednesday, we decided to spend some time walking in the creek. While it was a little slippery on the rocks and moss-type plants, it was fun to walk across. We didn’t get too close to the geyser, even though it wasn’t going off. This was the geyser just behind us to the left that is not shown in the above picture. 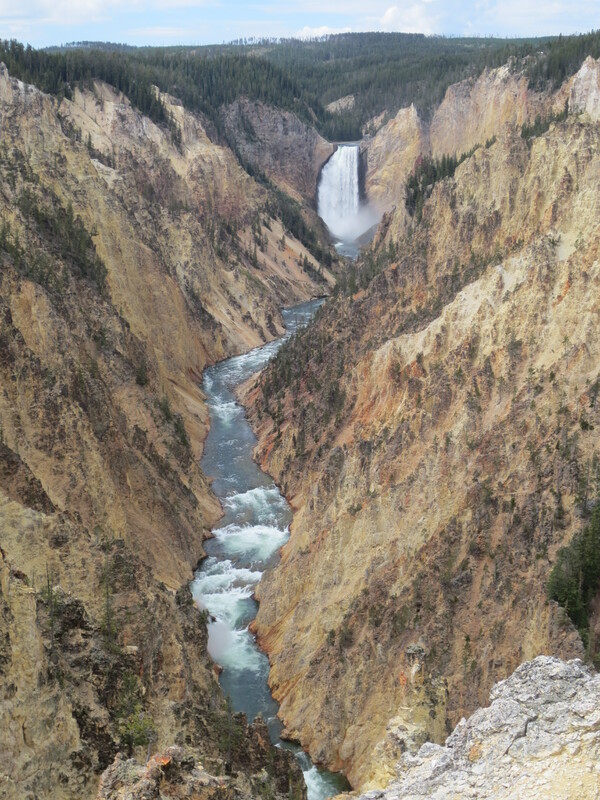 On of the most amazing views was when we went to the Grand Canyon of Yellowstone. It was so beautiful, we went twice. Wednesday, we went on one side, Friday, we went to the other side. The canyon is very deep, and has several waterfalls along the river. We went to a place called Inspiration Point. The kids weren’t very impressed, since part of it was closed. Most of it though, was amazing! One of the waterfalls in the Grand Canyon of Yellowstone. On Friday, when we went to the opposite side of the canyon, a few of us decided to take a little hike. We wanted to go to one of the two spots that go right to the top edge of the waterfalls. Nikolai, Michael, Dysin and I started the hike to Uncle Tom’s Trail. This trail has 300 steps that take you to the edge of the falls. It is not an easy hike. Somehow, along the trail, I looked at the map, and doubted we were going to the right place. We turned around, and hiked a different trail the opposite direction. When we passed the rest of the family, Dysin decided to stay with them. We hiked the trail the took us to an overlook over Upper Falls. It turned out that Uncle Tom’s Trail WAS the trail we were looking for. 😦 We added it to our “things we definitely don’t want to miss next time” list. A view from near the top of one of the waterfalls. 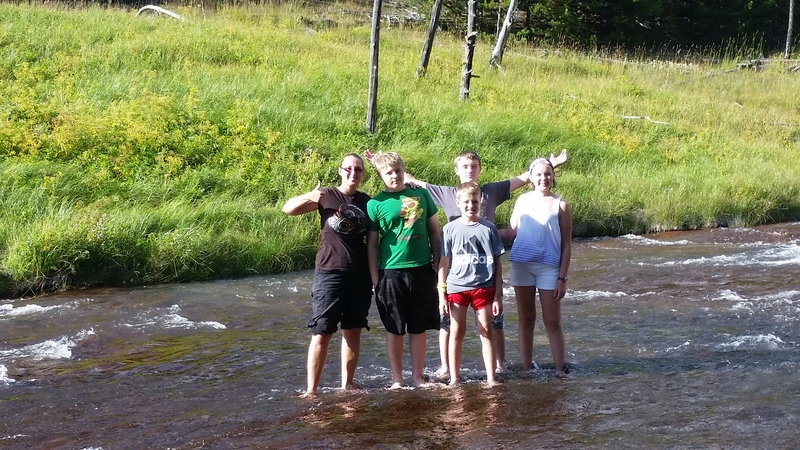 One thing we didn’t do that would have been cool, was to swim in the Firehole River. As we were driving to that area, we realized the road that goes to the main Firehole River area was fairly narrow, and was FULL. People were parked everywhere, and we decided to just drive through. This was another thing added to the list of things we will definitely do next time. We did, however, swim in the Boiling River. More on that later. 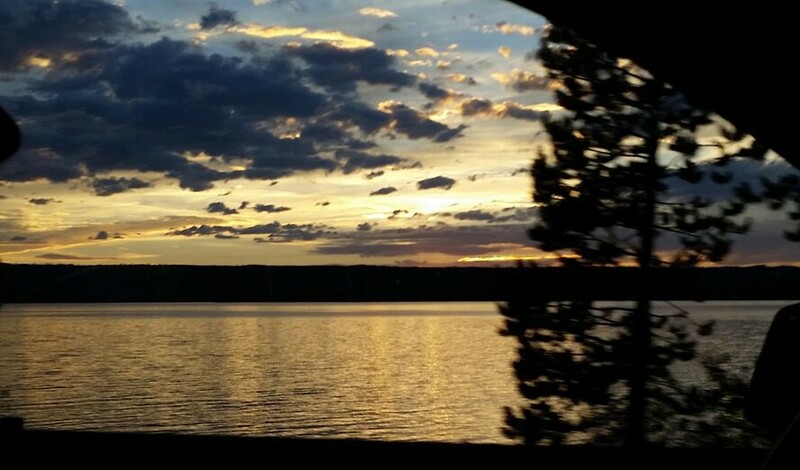 Sunsets over Yellowstone Lake were gorgeous! Whether it be pulling over to watch animals play in or near the water, walking to an extraordinary view of the many waterfalls, or skipping rocks across a creek, you won’t want to miss checking out the many water features in Yellowstone Park!